There’s something magical about being able to walk through a garden instead of just look at it. A colorful and fragrance-filled route between your house and car gives a quick recharge to your spirits as you head out and back, and it gives your home a friendly vibe. When you can create a planting that does all of that and gives your home outstanding curb appeal from the street, why would you ever stick with a traditional foundation planting of boring old evergreens? Here are three things to keep in mind when planning a welcoming walkway. Keep them close. 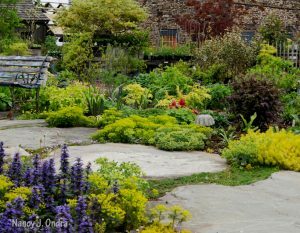 A planted pathway is a perfect place to show off small specimens of extra-special perennials and bulbs. You can easily watch their progress as you walk by them often, making sure that they get the pampering they need and preventing them from getting crowded out by more vigorous companions. Once the little gems have matured enough to hold their own, then you can move them to other parts of your garden. Or, just leave them here to get the admiration they deserve. Don’t skimp on the width. 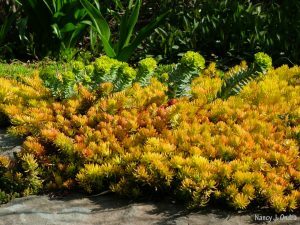 It’s nice to be able to brush against some plants as you stroll along a garden path, but if it gets too overgrown, it can be difficult or even dangerous to walk through. You can save yourself a lot of cutting-back later if you make the path plenty wide at the very beginning. 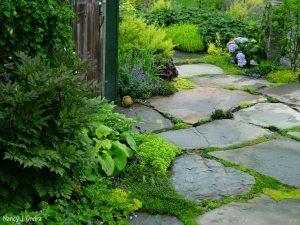 In a light-traffic area — a walkway leading to a side or back door, for example — you can get away with a planted path that’s 24 to 30 inches wide. A heavily traveled path really needs to be wider: 3 to 4 feet across is usually about right. It may look too wide at first, but once the plants start filling in, it will be just right. Think ahead. We gardeners understand that bees are busy doing bee things and not out to get us, but your guests and delivery people might be hesitant to walk along a flower-filled path that’s buzzing with pollinator activity. 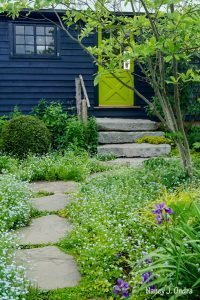 If you dream of being surrounded by an abundance of blooms, consider planting them along a lesser-used route—in a side yard, for instance, or along the path from your back door. 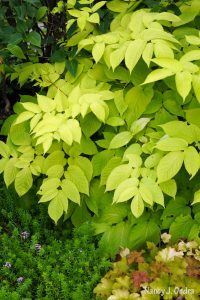 In high-traffic areas, concentrate on plants with colorful and/or fragrant foliage, such as ferns, hostas, and ‘Sun King’ aralia (above) for shade or ornamental grasses, artemisias, and ‘Angelina’ sedum (below) for sun.